My rhubarb is finished I think for this year. A stalk or two maybe can be salvaged, but otherwise, that's it. Besides, the leaves are developing some holes outlined in red, and well, I think it's just time to be done with it. Fortunately, this problem doesn't hurt the stem so I have read. I believe it's a fungus related thing. Sure has been rainy here in the last week, so I don't doubt this is due to excess moisture. At least I got something out of it this year. I am only in my second season of trying to get a good patch of it going. Made a few things, froze a little, and gave a little away. Hope all of you did well and even better with yours. 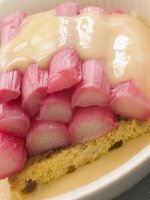 Spread rhubarb into a greased deep 10" dish. Tip for next Spring - Don't worry, I will remind you. Dig in (just below an inch of the dirt) some well chopped banana peels. They will decompose that much quicker, and act as a growth stimulant for rhubarb and all of your plants. Blueberry Lover? Combine with your rhubarb for two good uses at the dinner table. combine above ingredients and spread over chops. Simmer 30 minutes and serve. Combine and cook over medium heat for 1/2 an hour. Stir frequently. Let cool, and refrigerate. This lady "Sara" is apparently well known for her cooking skills. 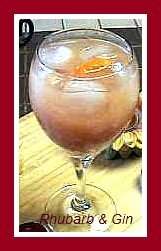 I have no doubt that this recipe is a keeper! Known to most New Englanders as a seasonal staple, this Queen Victoria Rhubarb Crisp has a special meaning in Sara's home. Her family has a history and connection to this dessert. This very plant, has its' own history Sara's mother explains. "Its' roots have been in the family since before the Civil War." A matriarch in her family line uprooted the plant that had been growing in Massachusetts. Afraid that it would be ravaged by the perils of war, she took the rhubarb to Nova Scotia where it remained until the early 20th century. From there, these prized stalks were then uprooted again, and split between the family's homes in Massachusetts and Maine. Queen Victoria is a slender stalk variety of rhubarb, and this family attributes the great taste to that fact. Preheat the oven to 350 degrees. 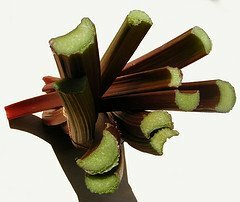 In a bowl, toss the rhubarb with ¾ cup of the sugar and let stand for 15 minutes, stirring occasionally. In another bowl, toss the strawberries with the remaining ½ cup sugar and let stand for 10 minutes, stirring occasionally. Using a slotted spoon, transfer the rhubarb to the strawberries; discard any rhubarb juice. Add the cornstarch, lemon juice and vanilla to the fruit and stir well. medium bowl. Using your fingers, mix the ingredients together until large crumbs form. Sprinkle the topping evenly over the filling and bake for 30 minutes. Check the crisp and continue baking for about 30 minutes longer, until the fruit filling is bubbling and the topping is nicely browned. Let the crisp rest for 10 to 20 minutes before serving. I leave you with some winning recipes from the 26th Annual Rhubarb Festival held in Lancaster County, Pennsylvania this year. 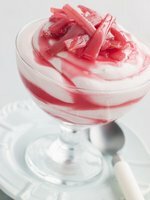 I really don't think there are many rhubarb recipes out there that aren't winners! 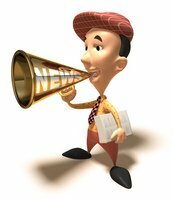 Visit Granny Mountain Blogspot to see. Such a lovely site!